Bamboo artist Antoon Versteegde mainly seeks his artistic freedom outside established institutes and exhibition spaces, in public locations with free access for everyone. He conceives life-sized constructions, which he designs as transient outdoor installations that he constructs with lightweight materials such as bamboo, flags, rope and rubber bands. The images created as a result, appear only to disappear. What remains is the afterimage. The bamboo installation leaves an impression behind in the spectator's memory. Versteegde's dream image becomes the image of a collective memory. The majority of his works is made for temporary display and not intended to be long term or permanent, and consequently has vanished. Only memories and photographs remain after the artwork has been taken down. The pictures at this web site act as a recollection. 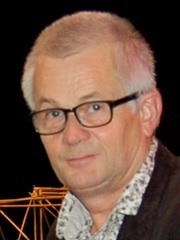 Antoon Versteegde gives lectures and workshops on bamboo around the world. It can last from one hour to several days. Would you invite him for this, please contact us via e-mail. See here an index of images. Find here the latest news.